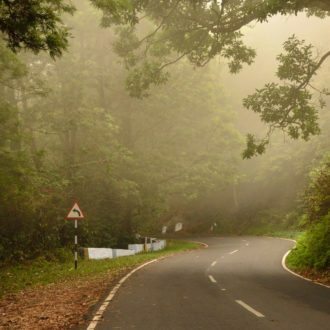 One of the best ways to discover a country is on a road trip. 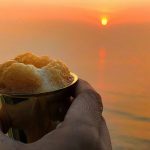 And while the husband and I were holidaying in Bali, I was keen to hire a car and drive around the country and visit as many temples as possible. The challenge however was to find our way through small villages and sea side hamlets as most of these shrines were located in the middle of nowhere, amidst spectacular landscapes and it was so easy to miss them. That is when I realized that gadgets had taken over guide books. While the husband suggested installing a GPS, I decided to use the maps on my mobile to ensure that we were on the right route. And that is where a browser like Opera Mini helped, as it compresses webpages up to 90% and showed me the way even in areas with sketchy network, while ensuring that my roaming bills were not very high. And that is how we discovered Bali. In one day, we crisscrossed the country, visiting three temples and watching a spectacular show, Kecak, a fire dance in one of them. 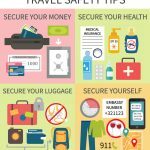 And we spent the remaining days exploring the countryside, visiting more temples and indulging in water sports – my first stint in scuba diving for instance, but that is another story… If you are heading on a road trip, here is a ready reckoner on three temples you must visit in Bali. And do not forget to save interesting webpages about the places you’re visiting on your Opera Mini, as you can view them later, even without network.. Believe me you will never be lost. My first stop was a 1000 year old cave, where I was greeted by ferocious looking door guardians, one of them holding a weapon up in the air. The massive goblin-like creature engraved at the mouth of the cave looked right into my eyes as I gaped at the stone relief. 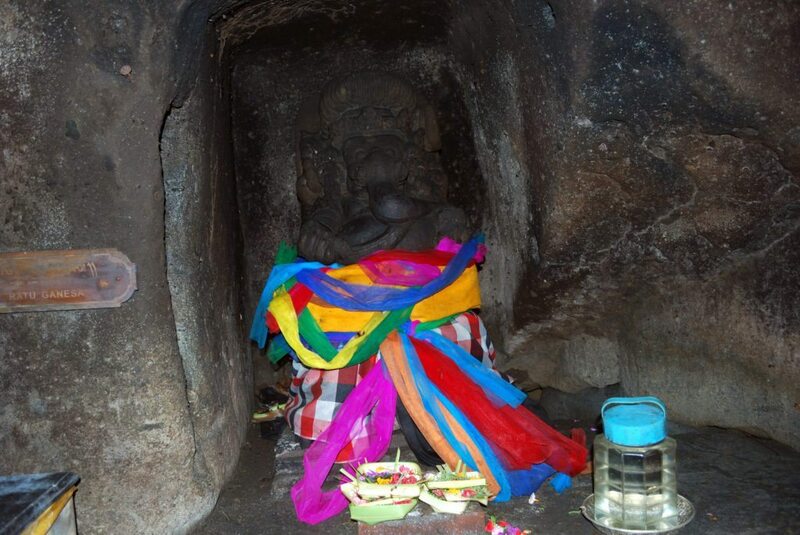 The cave was dedicated to the elephant God, Ganesha. Entering the dark cave with a bright orange sarong wrapped around me, I realized that Bali was both familiar and exotic at the same time. It was not just the deities and the demons, but there was a mysticism in the air that could be felt everywhere. Inside the cave, a Balinese Ganesha clothed in bright clothes smiled at me, as another shrine housed the trinity. Outside, the greenery was all enveloping as the curved figurines in the tank , holding pots in their hands, poured water to wash my feet. A flight of steps took me down the gardens as I saw several smaller shrines dotting the landscape. 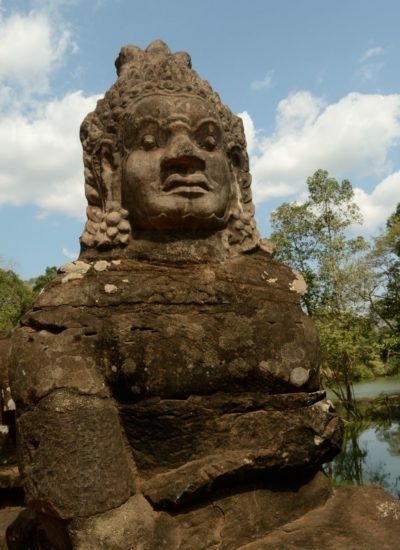 I saw a carved face in the rocks, partially covered by moss, which the locals referred to as Buddha. The 11th century site, called Lwa Gajah, was not discovered until the 1950s and was believed to be a sanctuary of a Buddhist monk. The River Petanu flowed around the lush village, creating a picture postcard of paddy fields sloping towards me, but it was time to move on. It was almost lunch as we drove through the lush town of Ubud watching the artisans at work, gazing at more terraced farms until we drove towards the active volcano, Mount Batur and the crescent-shaped crater lake.Amid the black soil of the mountain and the emerald blue of the lake was a tiny train of travelers making their way up the crater, some of them stopping by at the temple, Pura Ulun Danu Batur, dedicated to water Goddess Dewi Danu. 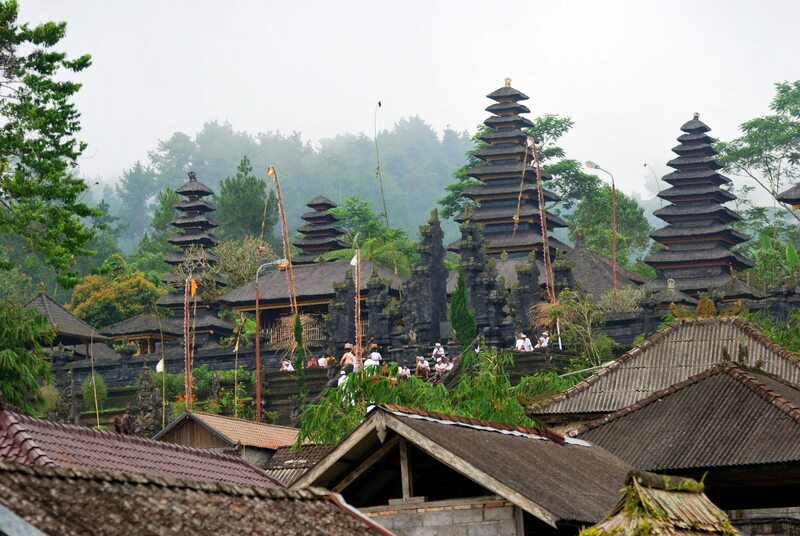 We, however, travelled towards Mount Agung, on whose slopes lie the most important temple of Bali, Pura Besakih. 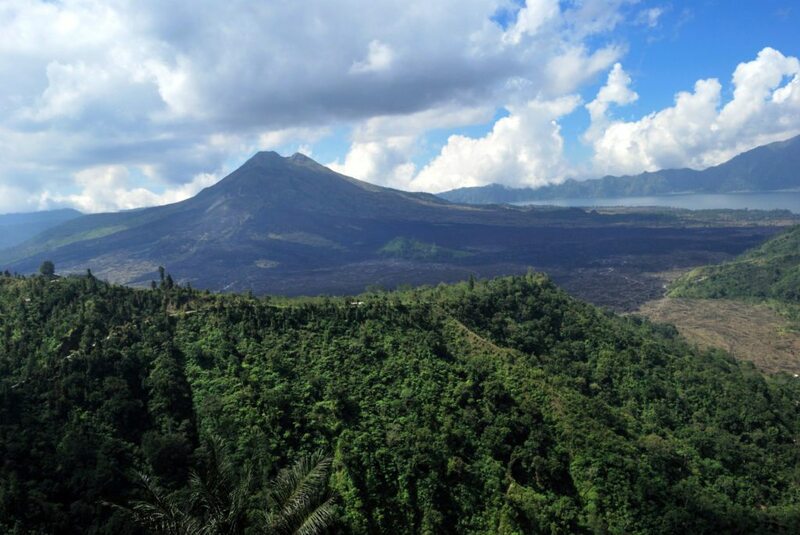 A group of women gently swaying their hips walked past us, carrying baskets full of offerings for their Gods.Balinese believed that Mount Agung and Mount Batur were fragments of the holy mountain, Mount Meru, and were brought down to Bali by the early Hindu Gods as their thrones. 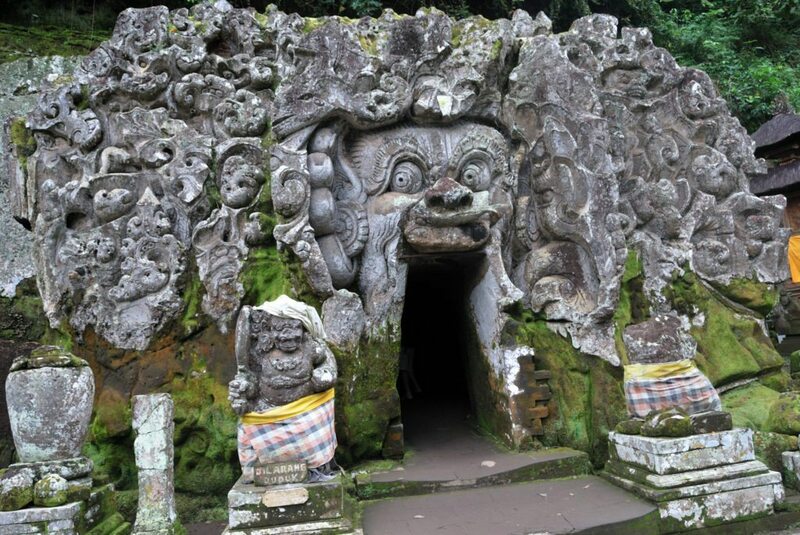 As the good spirits resided here, the temple here was often referred to as the Mother Besakih with more than 20 shrines that literally looked like houses of the deities. A sudden magical spell surrounded the temple. And then the mist came calling as the skies suddenly turned from blue into a pale white. 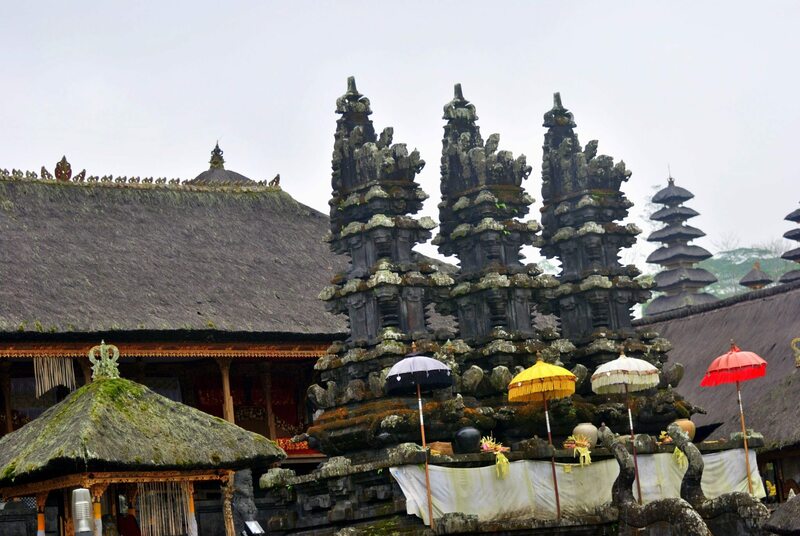 A never ending flight of steps decorated with ornate sculptures took me towards the Pagodas of Pura Besakih. Located amid courtyards, the many shrines were built in clusters at various levels, almost giving me a sense of climbing the summit. 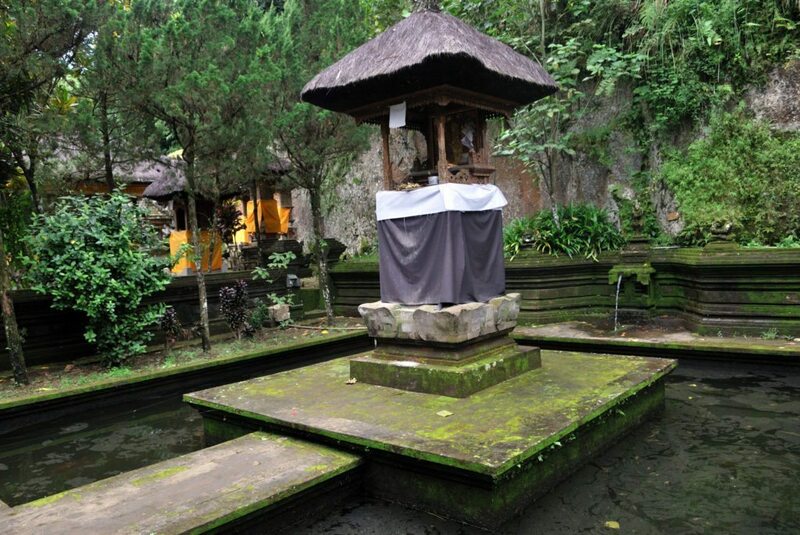 The Hindu philosophy of Mount Meru being at the center of all universes was reinforced here through the architecture. 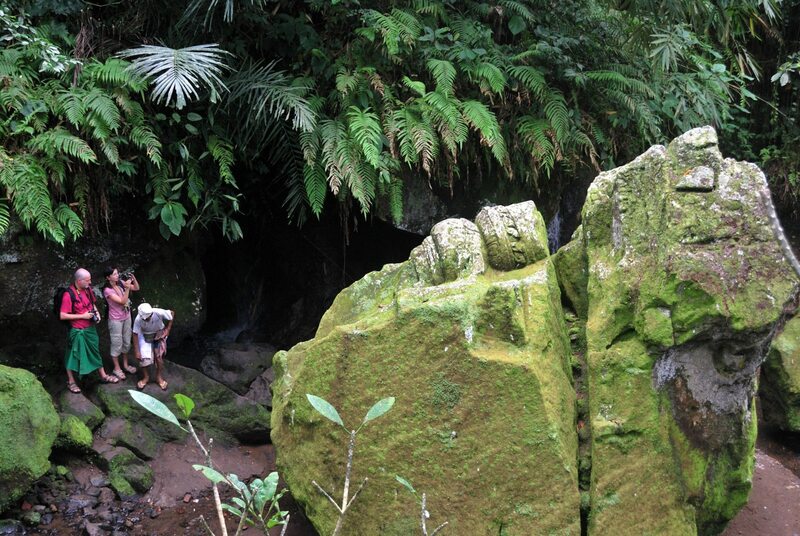 We followed the locals into the shrines, but were told that we could not enter the sanctum. 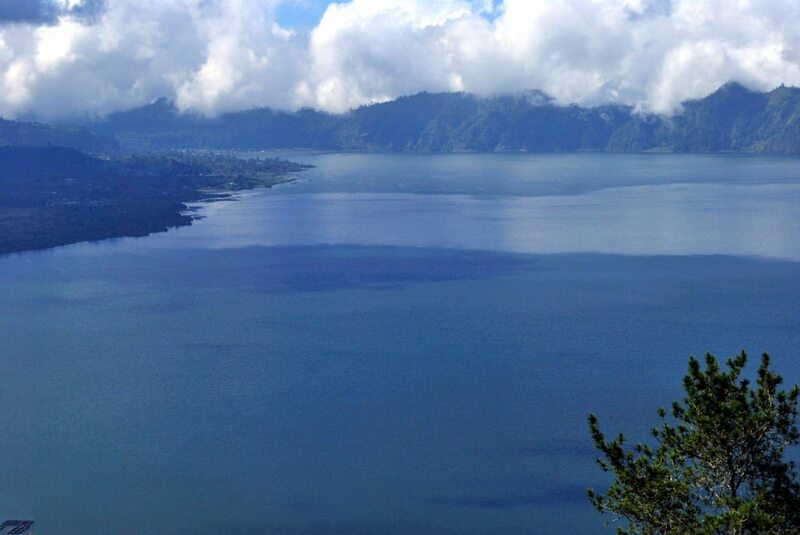 I looked around and saw wisps of clouds floating around, covering almost everything from small villages, lush terraced fields to the mountain peaks . For a moment, we just lost ourselves in the silence . Many writers have waxed eloquent about the tryst between the setting sun and the oceans against the backdrop of the rocky island that houses one of the most ancient temples, Pura Tanah Lot. The 15th century shrine, dedicated to Balinese spirits of the seas, built under the direction of a priest is believed to be guarded by snakes. After a long drive, we reached Tanah Lot just in time to see the sunset. It all happened within seconds. The ball of crimson dissolved into the oceans leaving tinges of pink and purple across the sky. 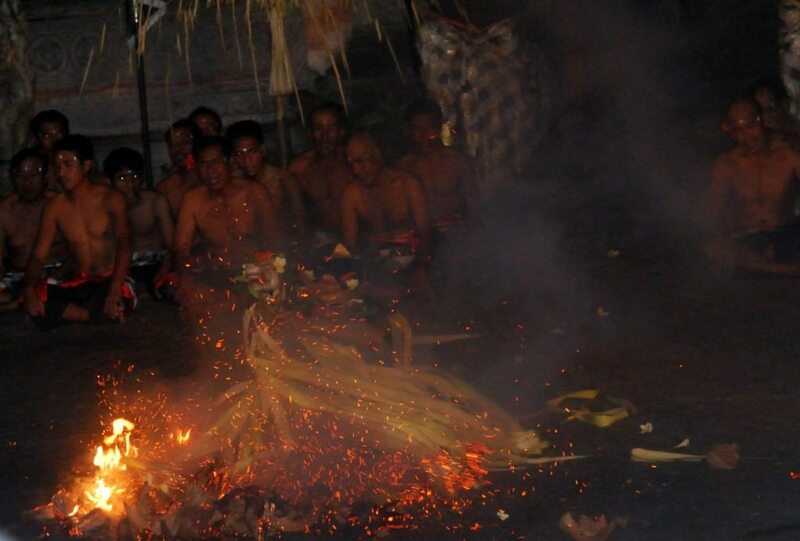 We hardly had a moment to gasp in awe, but I was whisked away to watch the Kecak or a trance-induced fire dance that had its roots in exorcism. As the circle of more than hundred men began to chant “chak,” swaying their arms and heads about the stage, their chorus moved from a mere murmur to a loud crescendo of voices.Depicting scenes from the Hindu epic Ramayana, the chanting often referred to as Ramayana Monkey Chant became rather dramatic and ended on a fiery note when the trance ritual began. A dancer on a wooden horse rushed into the stage and gave such a power-packed performance that it left me gasping and speechless as he jumped into the flames in a state of trance.I stood there transfixed, as the performers put out the fire and dragged the dancer out while the applause echoed down the shore. I lingered around for a while as the performers left and then walked towards Tanah Lot one last time to soak in the moment In a few moments, we were back in the car and were thinking of the day spent in the company of gods, demons and spirits. But then it was time to explore a different facet of Bali – the night life. I switched on my mobile and I keyed in the next destination – Kuta ! And my Opera Mini took me into a world of frenzy and energy. 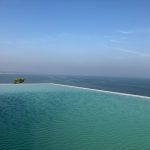 If you are looking at more experiences in Bali, then here are ten things to do in Bali and more posts below. Visit to temple is some thing imaging for some one and every one enjoys it. 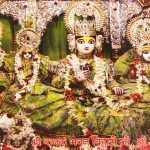 You have enjoyed your visit to temples the most and its also good read for me to learn about it. Bali is such a gorgeous place. great article on temple …. Bookmarked for future reference! 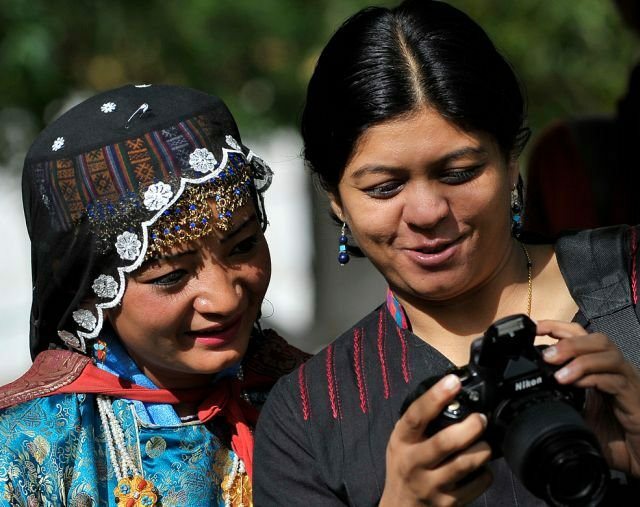 Lovely photos…. Very nice post and lovely pictures. 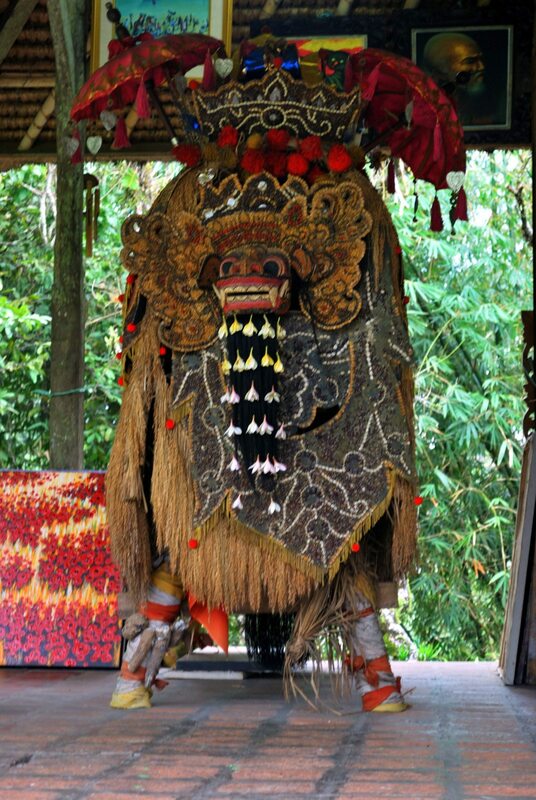 Being a Hindu part of Indonesia, Balinese rituals look similar to that in India. Thanks for sharing. 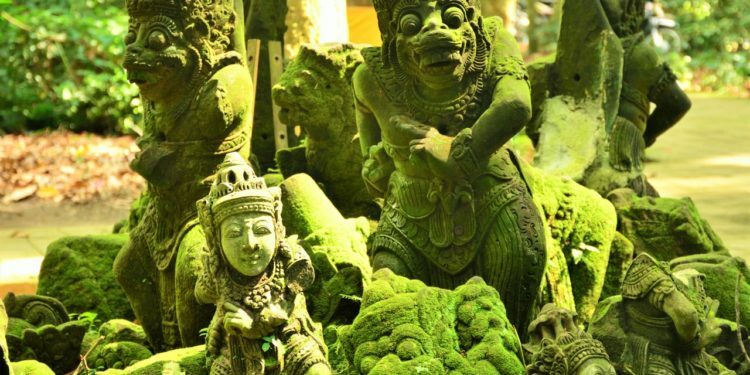 There is no denying that the temples around Bali are fascinating. 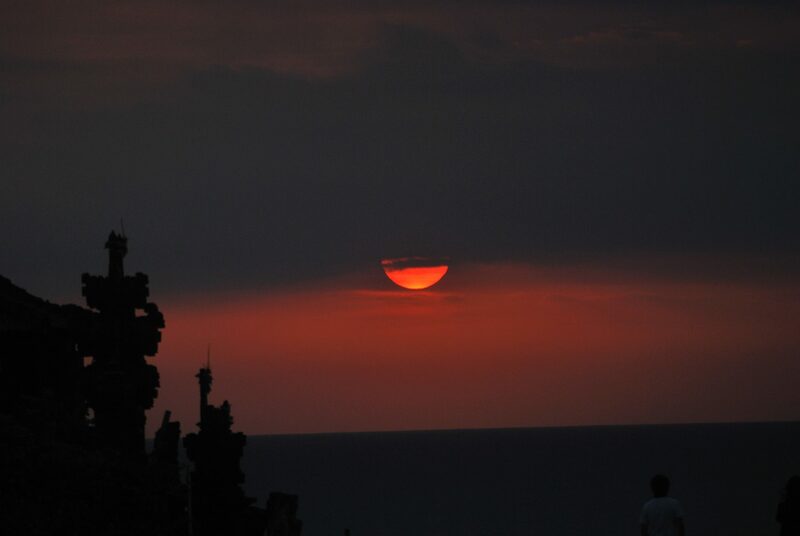 You managed to capture them well and I love the sunset photo over Tanah Lot. Thanks so much..I loved the picture too..
that sounds like fun too..